Who knew something so little could instantly make me love my locs even more? This was so needed because I was in some kind of rut with these bad boys. These colorful locs were inspired by a middle school friend of mine. I swear I haven't seen chick since we were in the 7th grade. But thanks to Facebook, we've reunited and I've been strolling through her loc photo album. She had several colorful locs and of course I told her I was going to try the same thing. It's super easy, y'all. Purchase some thread/yarn. Any color and brand is fine. Be sure to choose some that is lint-free. I can't remember the brand of this yarn but it works perfectly! Although I do wish it had a bit more shine to it. 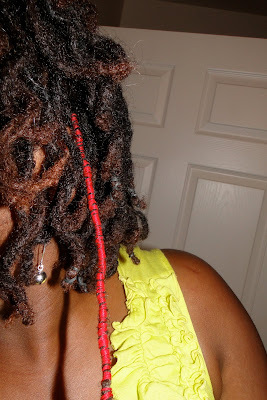 There is no real strategy or technique when twisting the yarn on your locs. Do know this: it takes a LONG time. It took me a good 10 minutes per loc. And if you feel the need to completely hide the entire loc, well...it may take longer. I didn't mind my hair popping through in this one. 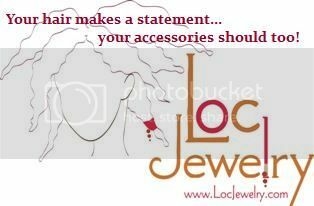 Start off by tying a knot at the base of a loc. Or in the middle. Begin tying the yarn around and around the loc. It's simple! It's almost as if you are 2-strand twisting your hair. But instead of with another piece of hair, it's with thread. The end is tricky. You should be able to tie a knot at the end but I can't seem to do that so I've got some string just hanging. If all else fails, you can use a rubber band at the end. Or add a loc adornment. Tis all, darlings! This does not damage the locs in any way. In fact, I think it helps assist with the meshing of my combined locs. Removing is simple. Pull on the end of the thread and is unravels right before your eyes. Yeeeep, it's like magic! The thread I selected is also pretty malleable. I can twirl it around my finger to create a curl or tug on it to keep it straight. Loves. this! I'm on the hunt for more unique colors and finishes of thread. Let me know if you've tried this or will try it! Ok, I can dig that & I'll see if a friend or two wanna play in my hair! Kudos to you on this. Thanks darlin'! Next time around I'm going to have a friend do this for me. My hands got tiiiiired. I definitely wanna try this at least once! Not sure if I'd have the patience to use yarn in my hair all that often but it sure does look cute! 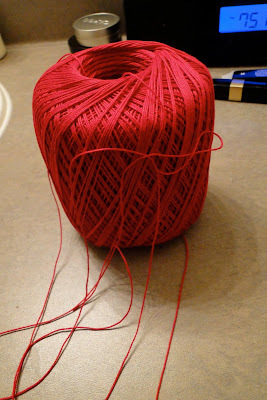 btw how long do you keep the yarn in for? How cute...yes, I will definitely be trying this! Ness---> I've had 3 of them in for 2 weeks now. I pulled one out to see if it was damaging the loc in any way and nope...all is well! this is too cute. i've been wanting to try it for a bit now. my only concern is that i think my dreads are a little smaller than yours, which means it'll take me longer and i'll probably need to wrap more for them to have an impact. Hey sis, I wouldn't recommend wrapping 2-3 locs at a time. They may end up meshing together if you left the yarn in for too long. Your slowly becoming a fave of mine! 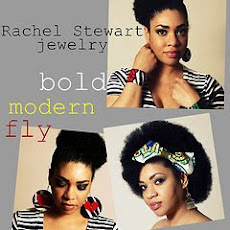 Love this.......I only saw this on caucasian girls hair , but DUH , why not locs !!!!! following ! please come visit when you can and perhaps follow ! this is awesome! I will be wrapping one of my locs today to commemorate my 2 year loc journey!